The bus travels on a long causeway over the lagoon, on our way to watery Venice. 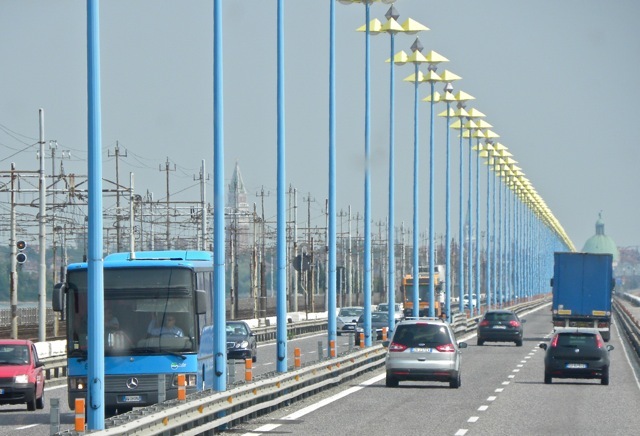 The causeway was built in 1800s, connecting Venice with the mainland by road and railroad. The railroad runs parallel to the road. 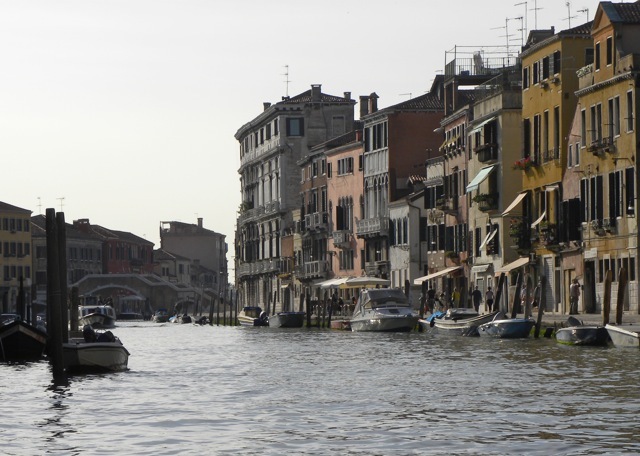 Land vehicles terminate at the edge of Venice and do not enter the city, which is served solely by boats prying its endless canals. A train on the causeway. In this aerial photo, the causeway is the straight line built on the green lagoon. We were transported by boat to our hotel. Our luggage were carried separately by this freight boat. 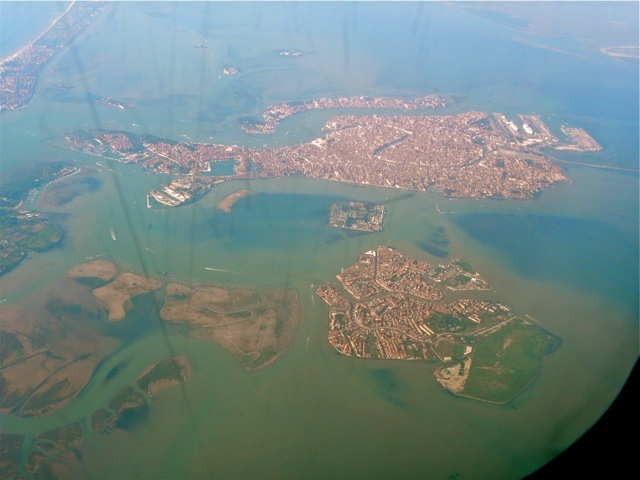 Venice is built on a hundred islands in the swampy lagoon. It was a refuge in 600CE, after the fall of the Roman Empire, for the mainland people from marauding barbarians. The refugees had to drive closely spaced logs into the bottom hardened mud to form platforms to build houses on. The demand for trees denuded the hills on the Dalmatian coast. Fortunately, those wooden logs petrified into stone-like structure and hold up houses for hundreds of years. 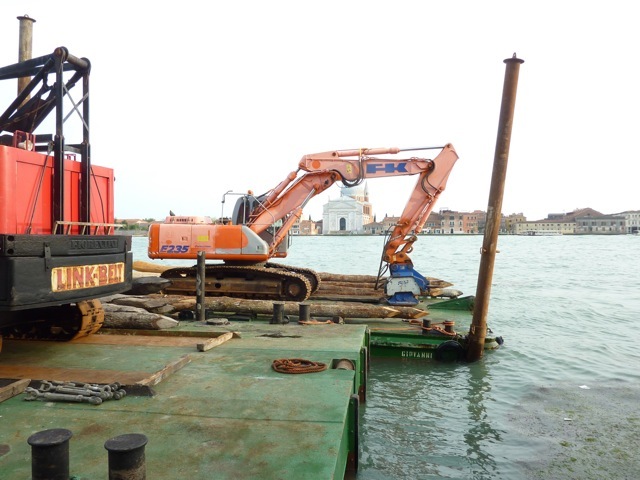 Logs are still being driven into the lagoon today. Instead of men lifting heavy weights to bang on the logs, machines do the pile driving. Some of the logs eventually settle and sink in the underlying hardened mud. Uneven settling cause heavy structures to lean, as this tower does. 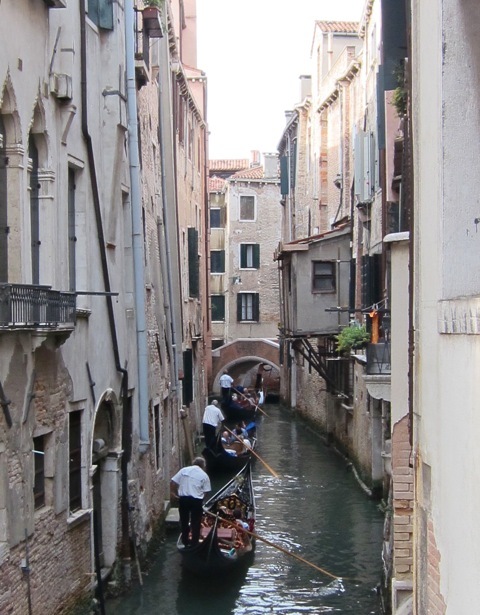 Venetians used to travel in the city by gondolas. 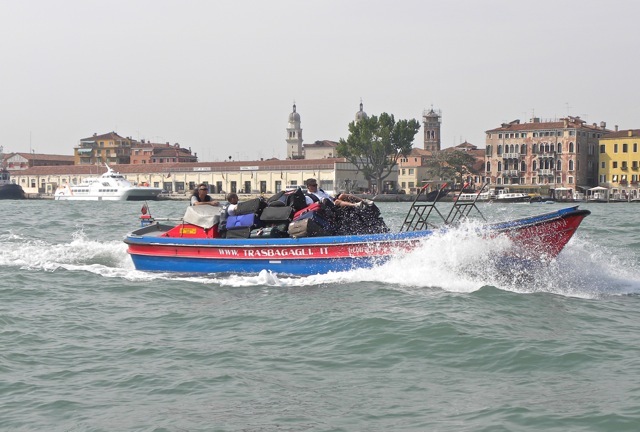 Today, they are the iconic and expensive sightseeing boats for tourists. 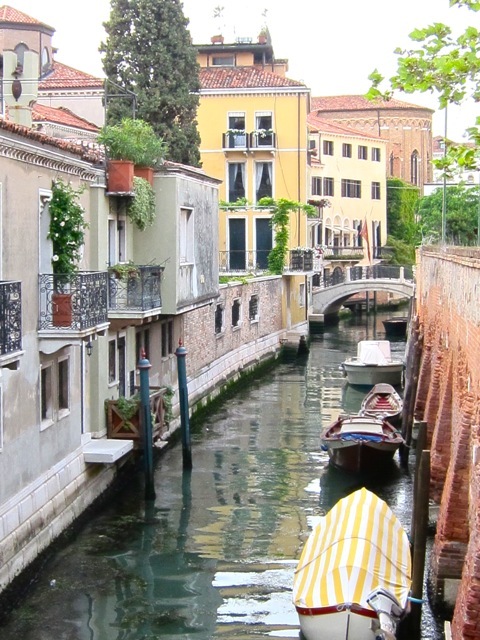 The gondolas used to be painted in different, competing colors. A decree by the government ordered all to be painted in egalitarian black. 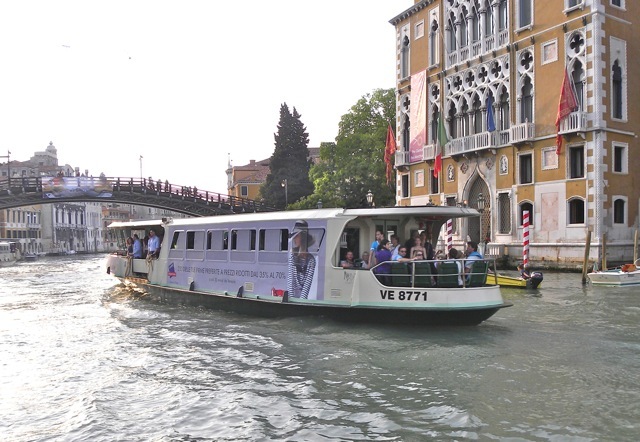 The vaporetto, water bus, brings passengers to all points of the city. It is frequent, fast, and relatively inexpensive. 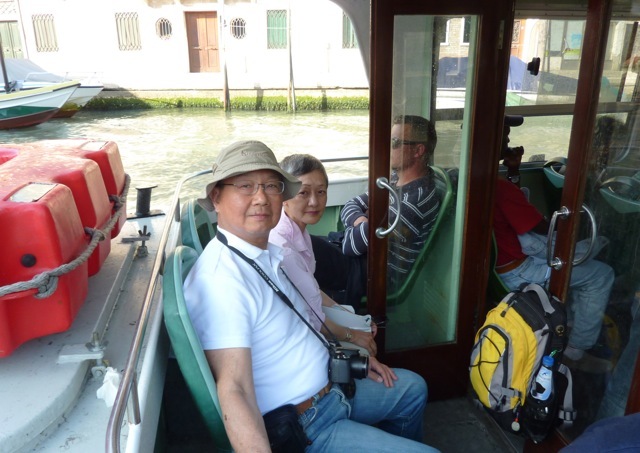 The choice seats of a vaporetto are the open air seats in the rear. Sally and I had a wonderful ride in the cool breeze. 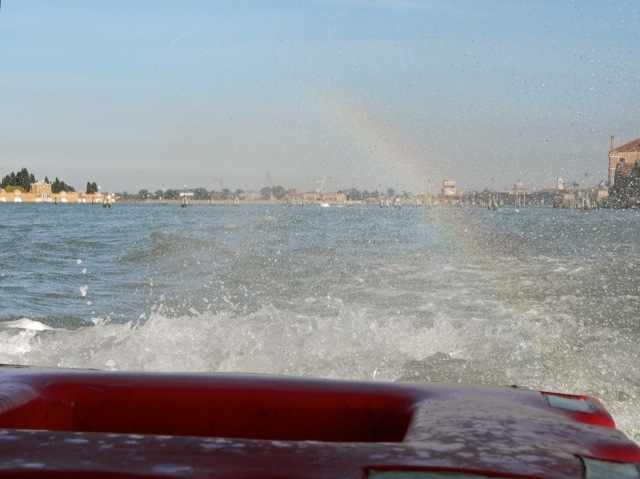 A rainbow danced in the mist thrown up by the speeding vaporetto. 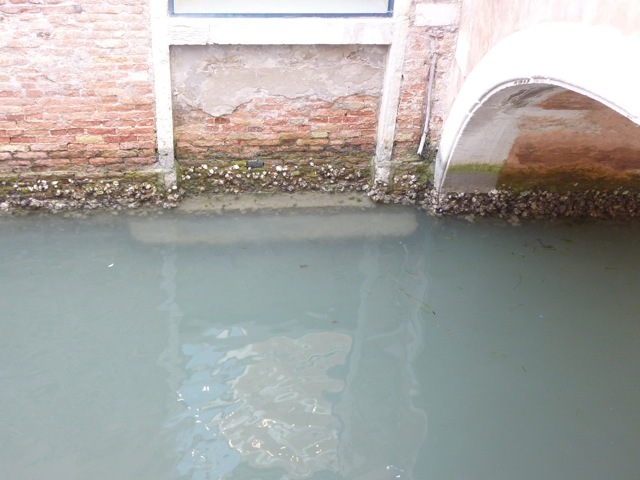 The water of the lagoon is murky. We saw a girl paddling a kayak overturned in the lagoon. 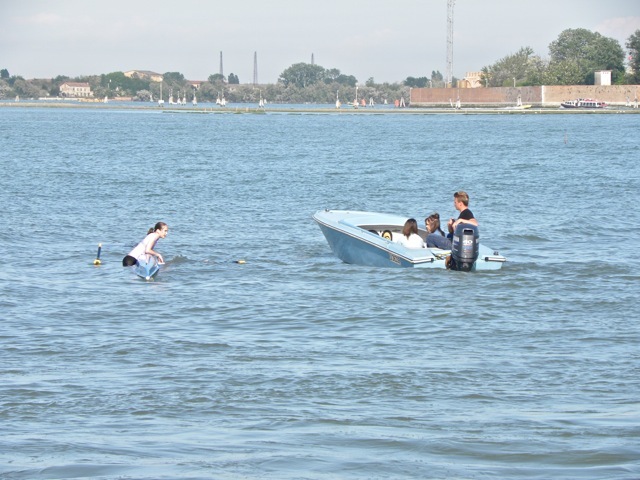 Young people in a passerby boat stopped to rescue her. I wonder how many showers she took to cleanse herself. 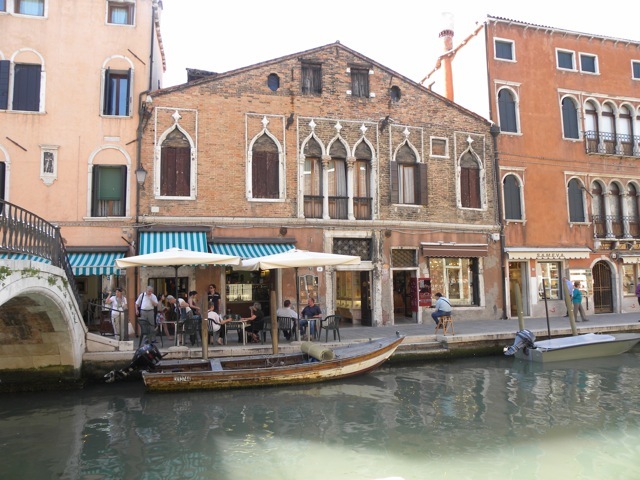 With many buildings deteriorating and little revenue to maintain them, Venice is selling advertising space to commercial firms. It was disconcerting to see a gigantic billboard on the San Marcos Square. Venice became a trading maritime superpower by 1200s, and declined when trade routes shifted after the discovery of the New World in 1492. Its wealth funded the construction of many comfortable private residences, ornate palaces and grand public buildings. 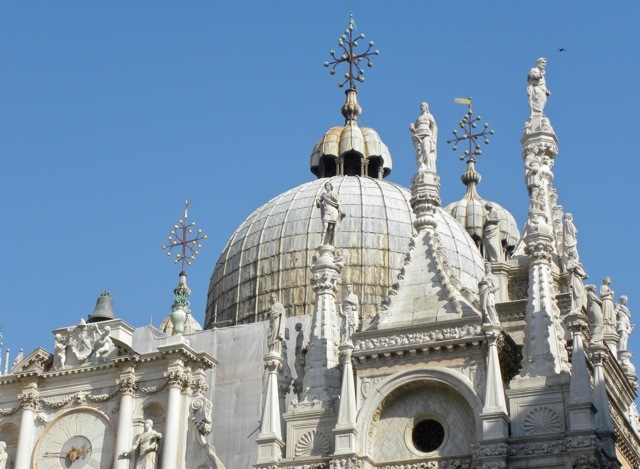 The doge’s palace, residence of the titular ruler of Venice, has columns pillaged from many lands by its ships and armies. 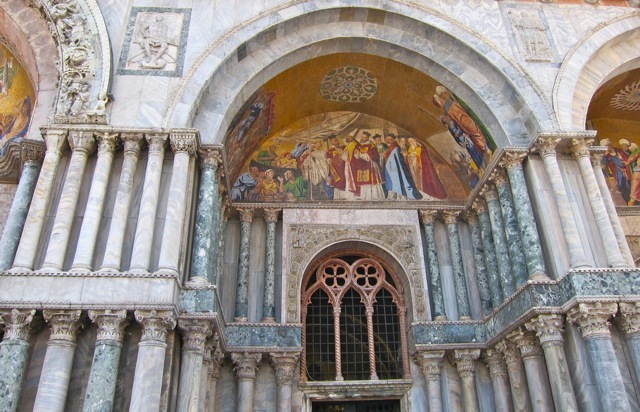 The mosaics gleam from their golden tiles. While the titular doge had a life tenure, the elected law makers had limited tenures and no consecutive terms. This was a model for the US government, except the US Congressmen had no limits on their terms of service. 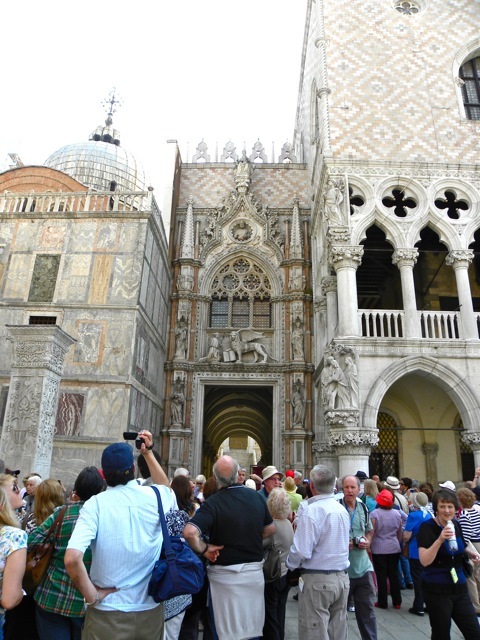 San Marco Square was crowded with tourist. We were herded like cattle through the palace and the basilica. 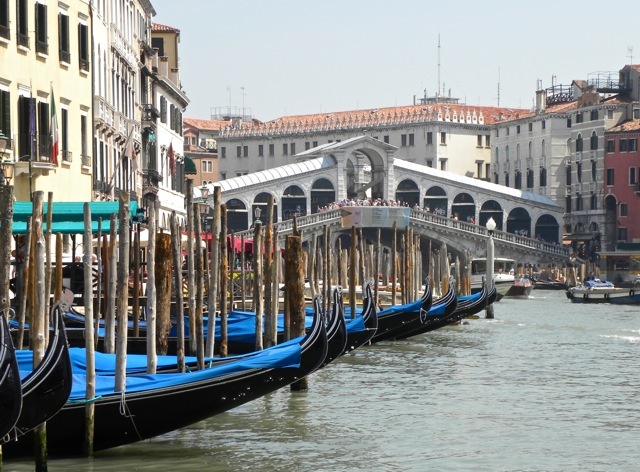 The iconic Rialto Bridge and the moored gondolas. 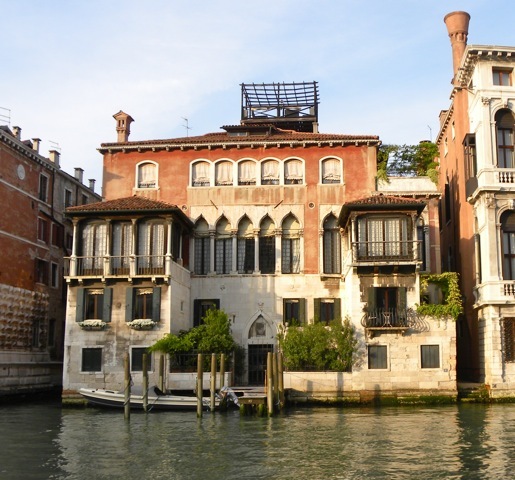 As the Grand Canal is prime real estate, mansions called palazzos occupy the water front. Even this small house is elaborately decorated. While most of the palazzos utilize every square foot of real estate, this house features a small garden and a break from the others’ water-edge facades. 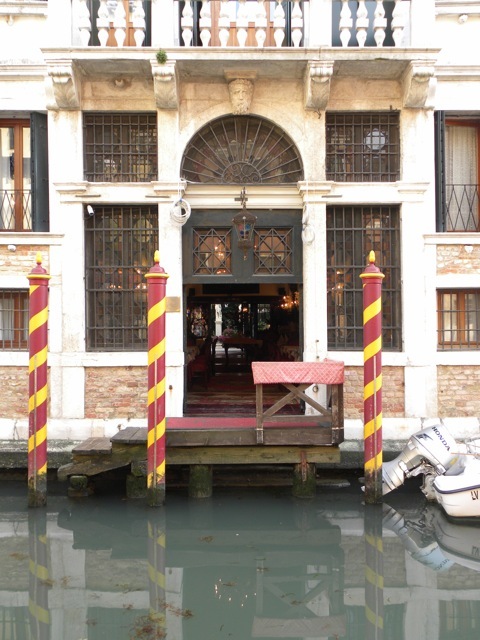 An elegant restaurant invites customers from the canal. 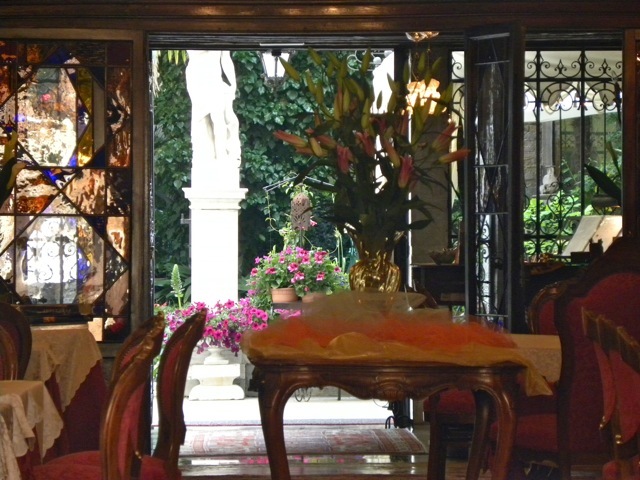 A restful garden sits on the far side of its dining room. Residential houses by the canal. 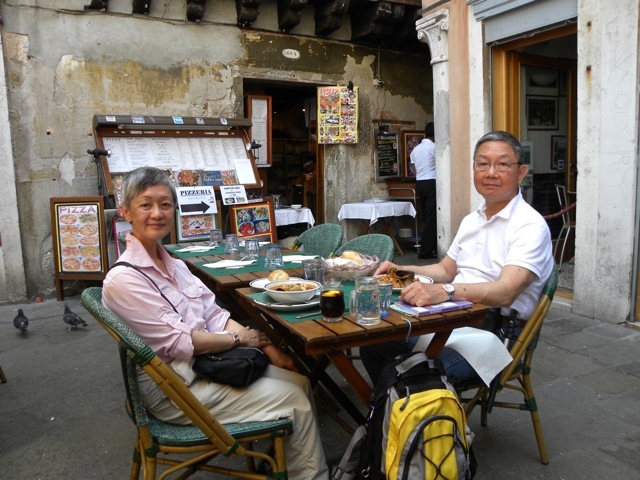 We enjoyed a delicious fish lunch near the fish market. Sally particularly liked her fish soup. 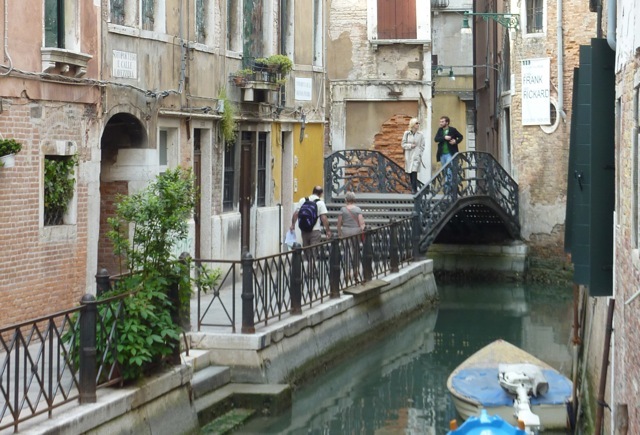 The labyrinth of canals and bridges make exploring Venice a wonderful walk. We came upon many pleasant sights like this peaceful neighborhood. 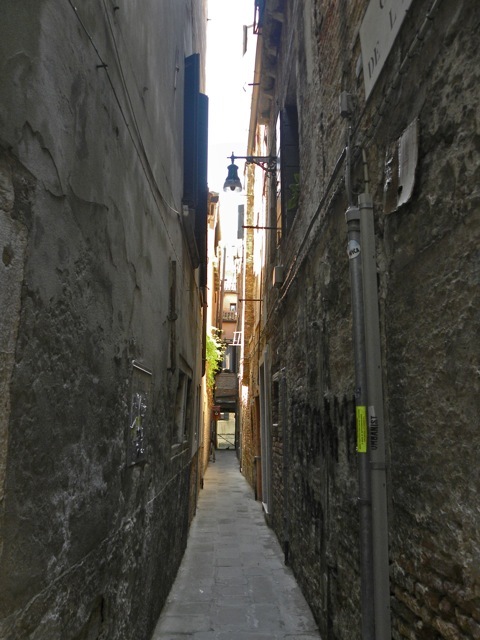 Others are narrow lanes squeezed between towering houses. 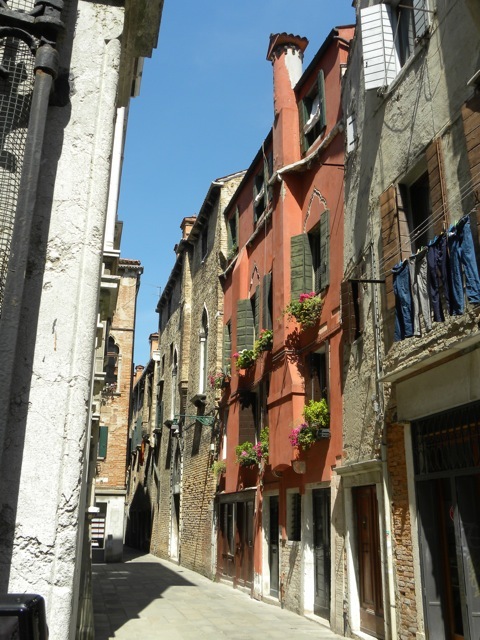 Marco Polo, a Venetian native, lived in this neighborhood. 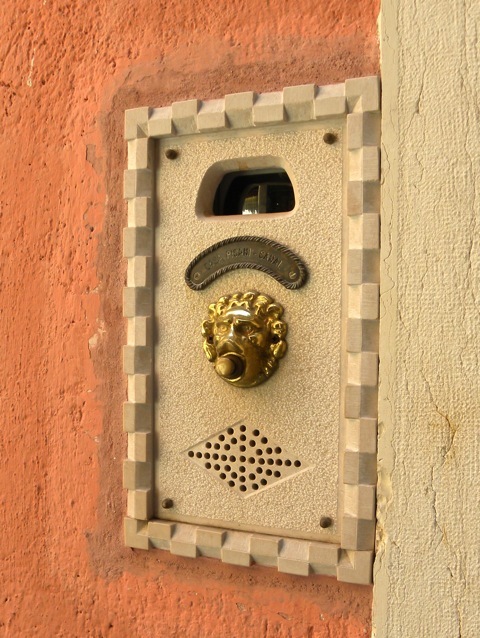 Some houses are lovingly decorated with carved stone plate for door bell, name plate, and intercom speaker. 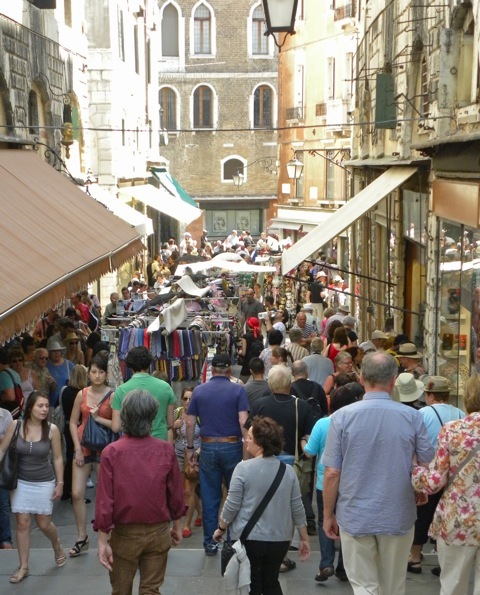 To squeeze every penny out of the tourists, almost every street near the city center is filled with vending stalls and sidewalk cafes. It became unpleasant to fight the surging crowds and negotiate obstructive stalls. 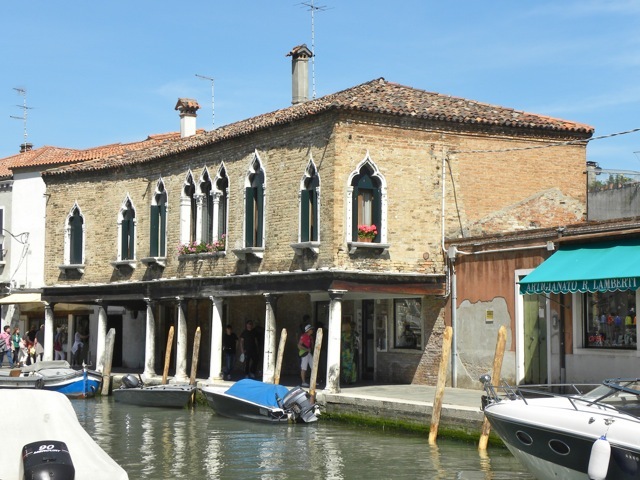 We escaped to the out-lying island of Murano, the glass-blowing center of Venice. This island has stores selling glass items and is free from crowds of tourists. 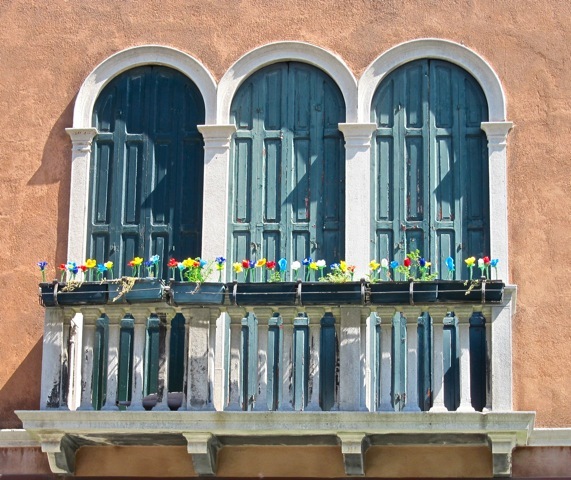 One window is decorated with brightly colored flowers. 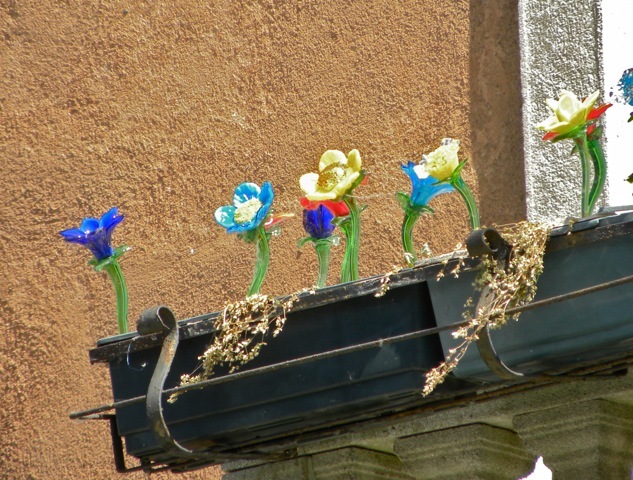 Upon closer inspection, the flowers were made of colorful glass. The quiet street by the calm canal was a perfect place for a cafe. 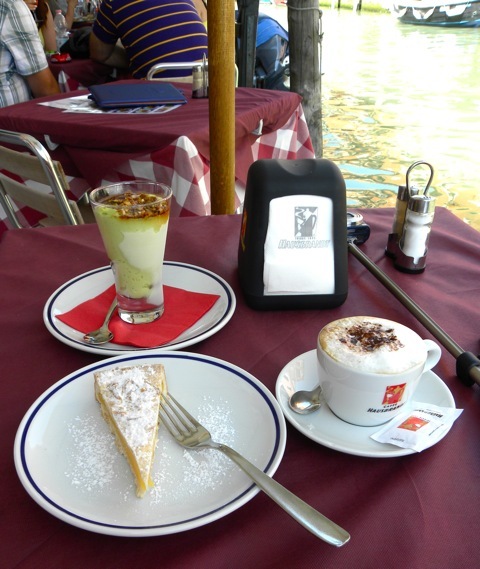 We enjoyed a refreshing afternoon pie, gelato and coffee. 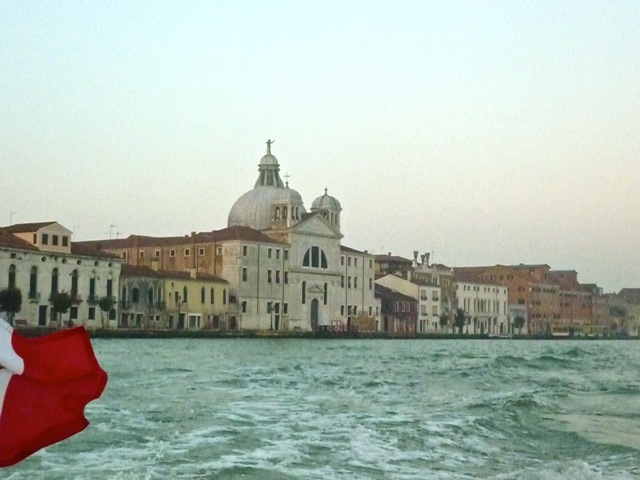 We were sorry to leave Venice by boat for the airport on the mainland. We stayed in the hotel housed in this domed, former convent. We savored its simple continental breakfast, especially the wonderfully fresh and flavorful mozzarella and ricotta cheese. 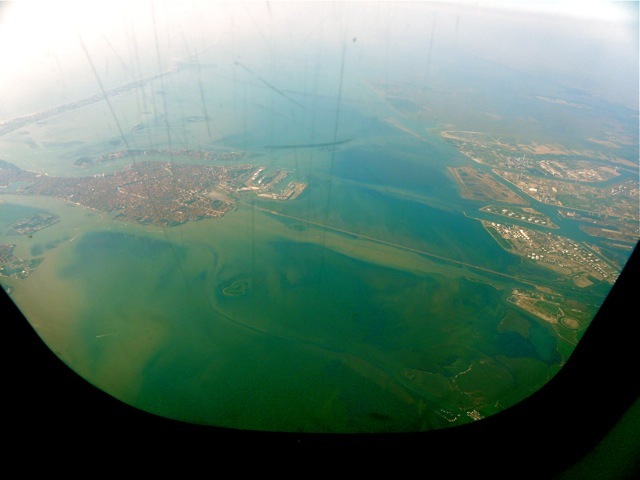 From the airplane, one last look at the islands of Venice. Our hotel is on the narrow island at 12 o’clock. 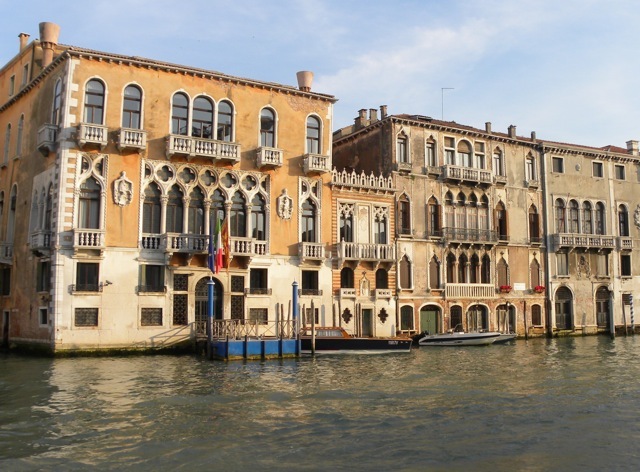 The Grand Canal is the “Z” shaped line at 3 o’clock. 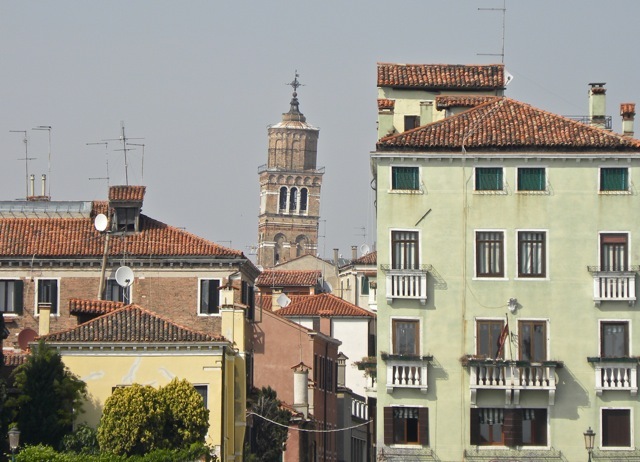 The serene island of Murano is located at 6 o’clock. 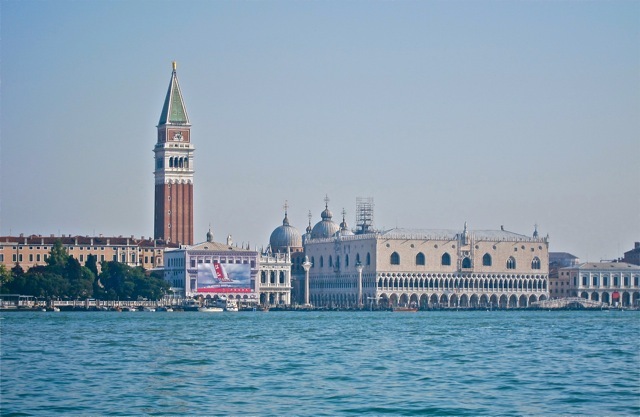 The square body of enclosed water at 9 o’clock is the Arsenale, the shipyard that efficiently churned out warships for the powerful Venetian navy. Posted by Robert Wu on Saturday, June 9, 2012, at 2:42 pm. Filed under Uncategorized. Follow any responses to this post with its comments RSS feed. You can post a comment or trackback from your blog.